On Friday, I kicked off a new blog series, Star Wars ABC's, with a post covering the first three letters of the alphabet. As we start this week and anticipate the Blu-ray release of the Star Wars movies next month, we move today to the letter "D."
D is for Death Star. "That's no moon. That's a space station," Obi-Wan Kenobi says with eerie certainty. Han Solo doesn't believe him; then again, Han doesn't believe in the Force. 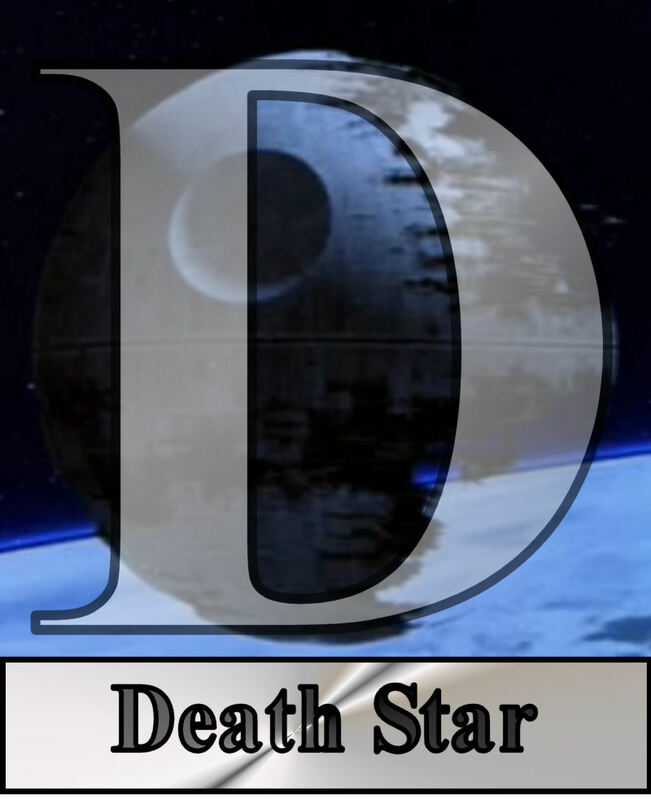 The Death Star is the Galactic Empire's ultimate weapon, a moon-size space station intended to deter any thought of disobedience or rebellion. How serious are these guys? They blew up Alderaan (side note: years later, we would learn Jimmy Smits was on Alderaan as well). Nothing says oppression like a hulking, gray sphere with a green laser capable of turning any planet into an asteroid field. Fortunately for the Rebel Alliance, the Death Star is like the big bully on the playground. He looks big, he acts mean, he seems tough, but if you kick him in a certain area, he goes down like a game of Jenga. For the Death Star, the delicate scrotal area happens to be a "small thermal exhaust port, right below the main port." And while it's ray-shielded, it's still susceptible to proton torpedoes. Because the Empire doesn't consider a small, one-man fighter to be a threat. Otherwise, well, they would've had a better defense strategy. So Luke Skywalker launches his proton torpedoes after switching off his targeting computer, using the Force to kick the bully in the balls. The loss of the Death Star left the Emperor mildly agitated. I'm not sure if it was his idea or what, but he decided to build a second Death Star. Somehow, he managed to keep the whole thing secret despite the fact it was larger and more powerful than the first dreaded Death Star. He decided to leak the idea to the Alliance's Bothan spies and then set a trap for Luke Skywalker and his friends. Had it worked, the Mighty Galactic Empire would've decimated its enemy and gained a new Sith Lord (years later, we would find out about the Sith's "Rule of Two," which I guess means Luke was supposed to kill Vader or the Emperor expected both of them to team up and destroy him. Or maybe he wanted the Sith Order's first-ever Leadership Triumvirate). Instead, the Mighty Galactic Empire allowed a bunch of spear-toting Care Bears to defeat its "elite" Stormtroopers (years later, we would discover clone-inbreeding may have been a factor in the targeting inaccuracy of the Empire's crack shocktroopers), bringing down the protective shield and giving the Rebels access to the Death Star's exposed superstructure. After a few Colts 45's, Lando flew the Falcon into the Dreaded Death Star and destroyed its Dreaded Main Reactors. At least it wasn't a small thermal exhaust port the second time around. TOMORROW: The letter "E." He is evil. He is smug. And his touch is electric!